VANCOUVER, CANADA – The 2018–2020 Vancouver Biennale launches its latest celebration of transformative art in public spaces June 20 with Saudi artist Ajlan Gharem’s Paradise Has Many Gates at Vanier Park. With the curatorial theme “re-IMAGE-n,” the Vancouver Biennale promises to challenge as well as inspire participants to reconsider their perceptions and understanding of contemporary issues at home and around the world. 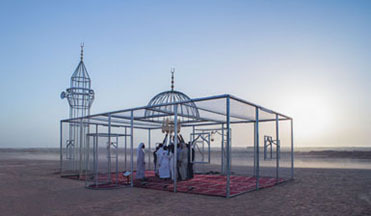 While Gharem’s architectural chain-link sculpture structurally resembles a traditional mosque, its use of unconventional materials and visual transparency challenges notions of religious orthodoxy and encourages communities of all faiths to “reimagine” a space free from Islamophobia. In this work, a communal space is framed as the focus for community building, acceptance, and tolerance. Paradise Has Many Gates will host “Weaving Cultural Identities,” an initiative that brings First Nations weavers and graphic artists together with local South Asian, Central Asian, and Middle Eastern Muslim communities to collaborate and celebrate their diverse cultural knowledge and self-identification, as well as an open “Sunset Picnic in the Park” on Multicultural Day, June 27. Vancouver-based Maskull Lasserre’s Acoustic Anvil: A Small Weight to Forge the Sea follows in early July in Leg In Boot Square, set along the seawall just minutes from the Canada Line Olympic Village Station. In keeping with the Biennale’s commitment to activate, animate and “re-IMAGE-n” public space, Lasserre’s three-by-seven-metre monolithic sculpture, emblematic of the essential forger’s tool, draws attention to the nearly unrecognizable industrial history of False Creek. In an ever-changing city of glass and concrete, this remembrance of raw and laborious man-made tools reminds us of the city’s rapidly evolving urbanization. Throughout the summer, Leg In Boot Square will host a series of classic black-and-white films of the industrial era in collaboration with the Biennale’s film program, CineFest LIVE, to take us back in time to understand how both told and untold stories in history have influenced the construction of our current identities. The Biennale is also committed to presenting artwork at the cutting edge of discussion and in keeping with the STEAM (science, technology, engineering, arts, math) approach to integrating the arts and sciences. In August, Colombian/American visual artist Jessica Angel will present her monumental installation Dogethereum Bridge at Hinge Park in Olympic Village. Inspired by blockchain technology, the artwork’s design was created through the integration of scientific algorithms, new developments in technology, and the arts. This installation, which will serve as an immersive space and collaborative hub for artists and technologists, will host a series of activations with blockchain as the inspirational jumping-off point. In what is expected to become one of North America’s most talked-about exhibitions of the year, Melbourne artist Patricia Piccinini’s Curious Imaginings will see the intersection of art, science, and ethics. For the first time in the Biennale’s fifteen years of creating transformative experiences, and in keeping with the 2018-2020 theme of “re-IMAGE-n,” the Biennale will explore art in unexpected places by exhibiting in unconventional interior spaces. The hyperrealist “world of oddly captivating, somewhat grotesque, human-animal hybrid creatures” will be the artist’s first exhibit in a non-museum setting, transforming a wing of the 105-year-old Patricia Hotel. Situated in Vancouver’s oldest neighbourbood of Strathcona, Piccinini’s interactive experience will “challenge us to explore the social impacts of emerging bio-technology and our ethical limits in an age where genetic engineering and digital technologies are already pushing the boundaries of humanity.” In this intimate hotel setting located in a neighborhood continually undergoing its own change, Curious Imaginings will empower visitors to personally consider questions posed by the exhibition, including the promises and consequences of genetic research and human interference. The 90-day ticketed exhibition is scheduled to open this September. Details of subsequent artists and events to be featured in the 2018-2020 Vancouver Biennale will be released as they are confirmed. The Vancouver Biennale celebrates art in public space. Each exhibition transforms the urban landscape into an Open Air Museum, creating globally inspired cultural experiences where people live, work, play, and transit, while becoming a catalyst for community engagement, learning, and social action. The Vancouver Biennale features internationally renowned and emerging contemporary artists that represent a diversity of cultural perspectives and artistic disciplines including sculpture, new media, performance works, music, and film. As a non-profit charitable organization, the Vancouver Biennale relies on the support of its partners and friends to deliver its award-winning programming. Please join us and help inspire through art. More information about the 2018-2020 exhibition and a full list of artists can be found here.